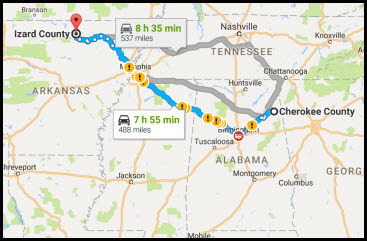 If you take the northern route, to Chattanooga, then west through Nashville, it’s about 535 miles. More directly west, through Memphis, it’s more than 450 miles. Or south to Birmingham and then west through Memphis, still nearly 490 miles. No matter how you get there, it isn’t an easy trip now. And it couldn’t possibly have been less so whenever it was, in the years between 1850 and 1860, that Boston Shew and others packed up what they had, left Cherokee County, Alabama, behind, and headed to new territory. West — northwest to be more precise — to Izard County, Arkansas. Why did my fourth great grandfather make that trip? What did he hope to find? And what happened to him there? But that 1850 census is the last record of their mother, Boston’s wife Elizabeth. There are no official death records for the time; we haven’t found a cemetery record. And the record in 1860 tells a very different story. Not in Alabama, where Boston’s sons by Elizabeth continued to live. Now Boston was hardly a young man at that time. The 1860 census records his age as 70. So it’s certainly possible that the father of Nancy’s child was someone else. Except for a few key facts. So… I can’t help but be looking at those 500 miles, give or take a few, and wondering. Are these his sons (are there descendants out there who want to DNA test??? )?